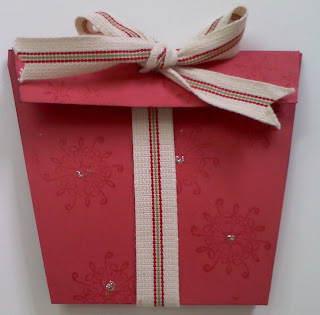 Create Embellish Adore: Gifts.. who doesn't like gifts? Gifts.. who doesn't like gifts? I saw something like this... had to make it and now wish I wouldn't have started .. Its so simple, that anything goes... everything except for my bows that look great until I take my finger off them to take picture. Its was straight - I promise you! 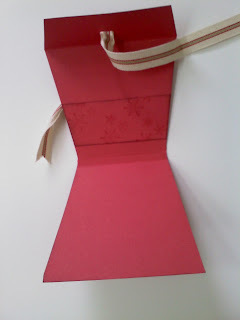 This it a great idea.. its a present and a gift card holder all in one... HOW GREAT IS THAT? Its like "here is your card and your present at the same time" theory. Versitile for any occason, I just wanted to try the new ribbon out from the mini catty... I like it... alot! As I am about to sign off and leave you to do some other fabulous creating of your own, I need to put one final word out there. Today, here in the US, maybe even other parts of the world, we are celebrating Patriotic day... its today 8 years ago that we lost our hundreds of men and woman thru a 'planned attack'. I will not stand on my soap box, but its a day that brings me sadness for many reasons. Its beyond the lives lost that day, and the days following, but the obsorbant amount of lives that remain to be tested and defeated. I don my American Flag at half staff today, to honor all of those who have lost lives and fight for us to have our freedom, safety and protect us. Thank you.